A musical version of the very successful TV series based in the busy antiques shop in Manchesterford. Wrinkly tights, coconut macaroons, eye shadow and Mrs Overall’s home-made sherry are all (visibly) waiting in the wings !! CAN anybody tell me just what actors have to do to get a standing ovation these days? 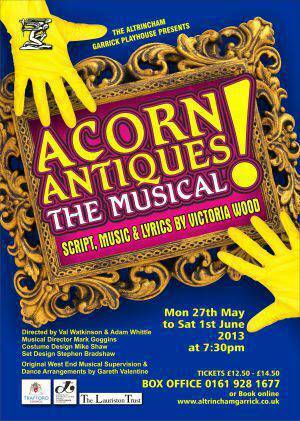 If any production deserves one it's?Acorn Antiques - The Musical, Altrincham Garrick's final show of the season. This is wall-to-wall perfection, from the expert comic timing and slick dance routines to the company's full blooded performance of Victoria Wood's crowd pleaser of a score, which has some occasionally naughty lyrics. Caroline Hickey is a scream as Mrs Overall, the doddery old tea lady who looks like she's about to spill her tea tray at any given second. Caroline is an exceptional character actress and Julie Walters herself, who immortalised this role, would have been proud of her achievement. Vicki Stott, who plays Miss Berta, has a singing voice to die for and there's a real chemistry between her and Laura Chandler, who plays her seemingly prim and proper business partner, Miss Babs. I say prim and proper but the mask slips very easily whenever an eligible bachelor enters their shop and Laura conveys both facets of this character quite superbly. There is a semi-serious theme running through the show with Wood lamenting the changing face of the high street, but if you go to see this show, set in an incurably old-fashioned antiques shop, you're sure to remember it for the genuinely laugh out loud funny jokes. This is a triumph for all concerned - make sure those box office phones are ringing off the wall. ALTRINCHAM Garrick has received a special message of support for its next production - from a comedy icon. 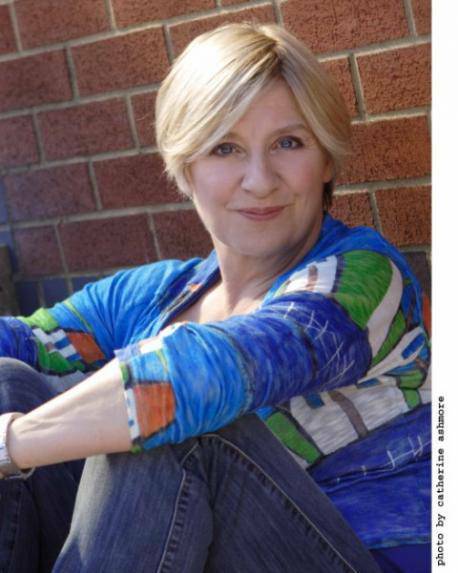 The theatre is staging Acorn Antiques - The Musical and its writer,Victoria Wood, has emailed the theatre and expressed her delight over the society?s decision to stage the show.Its set in an antiques shop in the fictional English town of Manchesterford and started life as a TV programme sending up soap operas. The shop is run by Miss Berta and Miss Babs who are less than ably assisted by Mrs Overall, their elderly tea lady. In the email, the Bury-borm star said: ?I'm so happy that Acorn Antiques the Musical! is getting another outing. I hope you all enjoy this simple tale of corporate greed, amnesia and macaroons. ?Although I never played my original part, Miss Berta, on stage, I did do two shows a week as Mrs Overall in the original West End production, when Julie Walters found herself having to go to Bingo. And it was very lovely to don the pinny and the marigolds, even for so brief a time. ?When I heard that Miss Babs and Miss Berta were coming back to tread the boards, I could do no more than echo Mrs Overall's famous remark" Ooh I am pleased!.? The plot of Acorn Antiques (The Musical) is pure comic fantasy; set on a high street in Manchesterford where the shopkeepers, with hardly any rent to pay and no need to make a profit, can open their doors each day without a single worry of customers actually buying anything, one of these shops is of course ?Acorn Antiques? run by sisters Miss Babs (Laura Chandler), Miss Berta (Vicki Stott) and with the help of elderly tea lady Mrs O (Caroline Hickey). This production, like many of the more modern musicals, was high energy and ran at a quick pace though I felt the show would have benefited if the pace had been more relaxed. Many of Victoria Woods? gags need to be ?milked? but with the speed of this show, there simply wasn?t time to linger and relish in the moments which were gone and lost before we had chance to enjoy them. Unquestionably, the strength of this show lied with the three sisters; Bab?s, Berta & Bonnie and of course the bonkers Mrs ?mummy? Overall! each of these leading ladies brought their own original qualities to the table. Vicki Stott effortlessly owned the stage and gave us a first-rate performance of the slightly dim but rosy Miss Berta with an outstanding delivery of ?Remind Him?. The role of Miss Babs was tackled head on by Laura Chandler who delivered star quality throughout, yes, ideally her role is more suited to an older actress though the angle which she?d cleverly approached Miss Babs? objectives were believably adapted to suit her age. The long lost Bonnie was powerfully portrayed by Sarah Taylor who freight trained her way through a remarkable performance, making a firm and inspiring impression in this production. And now - for the part which everyone came to see - Caroline Hickey had the strain of rendering one of Victoria Woods most recognisable characters; Mrs Overall. The success of this production relies heavily on the impersonation of this character and Caroline had her down to a tee! The voice, scrunched up face, the famous walk were all so accurate it added to the comedy. The only shame is the lack of scope to add to the part to make it your own as this can be nothing other than a direct imitation, never-the-less, Caroline expertly fitted the bill and certainly didn?t fail to have tears of laughter running throughout the Garrick?s auditorium. The band played in a room behind the stage and the sound was channelled through to the auditorium which unfortunately lost the sense of a live band, some of the players could not be heard as clear as others and the sound, in general, was too low. This seems to be a continuing problem which I find to be quite irritating as I (as I?m sure others do) want to enjoy the music. The biggest part of my frustration is knowing that the band was of a high quality and not being able to experience it to the full degree. The comedy sketches of which this musical is based translates very well onto the stage with the inclusion of some satire references to popular stage shows such as ?Les Mis?, ?Hello Dolly!? and ?A Chorus Line? which were recognisable and well received. This show has a large cast and I can?t deny that parts (particularly the full company numbers) seemed under rehearsed, some members of the ensemble didn?t know the words to company numbers and the movement was not as crisp as I?d have liked, however, with the nature of this show and it?s comedy style you could argue that this was intentional, if this is so; more needed to be made of it, but in all honesty I'm not sure it was. We got strong support who all added to the fun and giggles, particular stand outs were the two pitiful adolescents (Claire Muldoon & Ryan Clarke), neighbouring shop keepers (Stephanie Niland & David Leathlean) and not forgetting the gays (Bill Platt & Brian Howlett). The set looked good (maybe a little too good as I really wanted to see it wobble!) and I enjoyed some quirky effects in particular the video appearance of ?Dad? which had me chuckling!